James Lett was the son of Aquilla & Charity Cobbler Lett. He was born on May 9, 1811 in Barbour County West Virginia. He married Margaret Lett born November 30, 1819. They married on Dec. 17, 1835 in Muskingum County Ohio. James and wife Margaret are buried in Young Hickory Cemetery, Lytlesburg, Muskingum County Ohio. 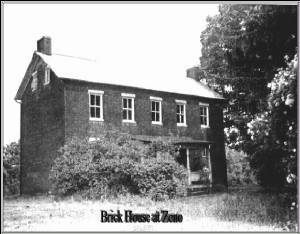 James Lett built a large brick house at Zeno, near the Pleasant Hill Cemetery on Coal Hill Road which was called the "Old Brick". The four hundred acre Lett farm had its own kiln from which they fired their own bricks and they even hewed their own logs for the beams of their houses and barns. Charles Henry Lett of Zanesville Ohio told the story of measuring the beams in "Old Brick" and finding them to be 60 feet long and that some of the beams were 18 inches in diameter at the small end. 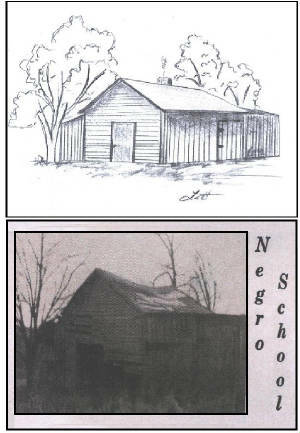 It was on his farm that the school house was built for "colored children" in response to a suit filed by Aquilla Lett Jr. and Joseph Tate in 1846. The school began in 1847 but met with resistance and was burned two times! The school was rebuilt in1853 and 1864. In 1864 a good frame was erected (see Photograph & Artist drawing). In 1856 the parents of the children who attended the school were allowed to choose there own school Director. The vacant school stood in Meigs Township for nearly 100 years. Charles Henry Lett recalls going inside the vacant building with his father Sherman and seeing what appeared to be hundred of names of relatives who had come to the empty building over the years and written the year of their visit and names upon the walls of the interior of the building. The school house stood until the 1950's when it was then destroyed by the coal company to strip the land of coal. "History of Muskingum County by Ewing.